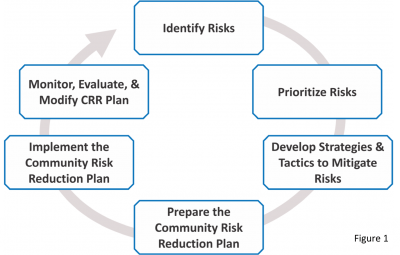 Community Risk Reduction (CRR) can be defined as: the identification and prioritization of risks, followed by the coordinated application of resources to minimize the probability of occurrence and/or the impact of unfortunate events. Much of the current literature and training materials suggest that Community Risk Reduction programs use a six-step approach towards development. Figure 1 depicts these steps.